On the 24th August 2012, Bayliss Executive Travel transported the European Ryder Cup Party from their hotel base in London to Heathrow to start their journey to the Medinah Country Club, Medinah, Illinois, USA to defend their Ryder Cup title. 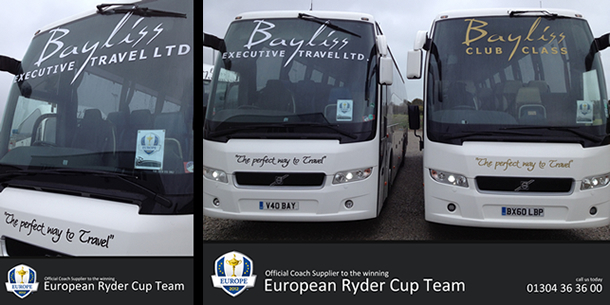 After defending their title in one of the most historical Ryder Cup wins in history, the party headed back to Heathrow, London on Monday 1st October 2012 to be greeted by a fleet of coaches, officially supplied by Bayliss Executive Travel. We are very proud to play our part in transporting the European party on their outstanding victories and would like to congratulate everyone involved in the Ryder Cup 2012. To find out more about the historic win, visit the Official Ryder Cup 2012 Europe website. If you're looking to transport a large group, just give us a call on 01304 363600 to discuss your personal requirements.